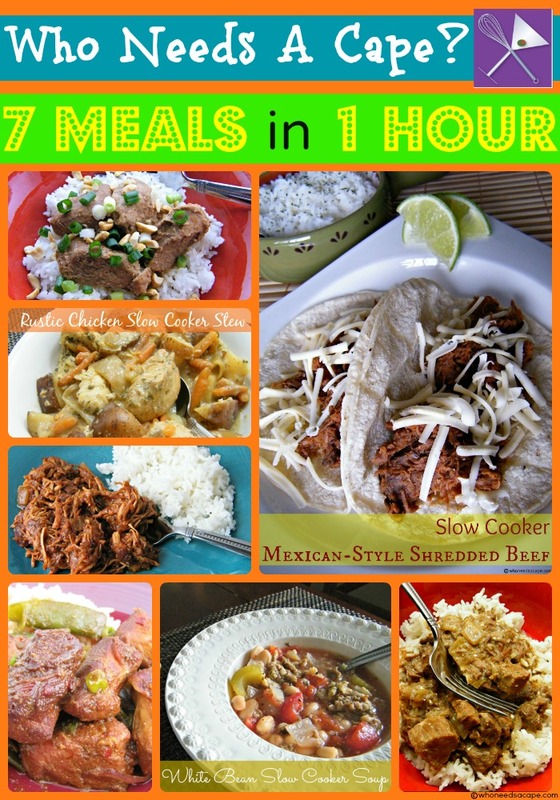 40 Freezer Slow Cooker Meals Part 2 - Who Needs A Cape? That’s right…I did 40 Freezer Meals. I still can’t believe it. It was a LOT of food. But I still am not having to cook dinner yet – and I love that part A LOT. 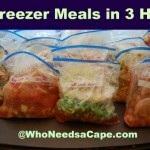 Have you done freezer meals before? If not jump in and get on it. It’s a life saver. I hate to say I’m a soccer mom, but I am. And a basketball mom, and a math club mom, and a working mom and…you get it right? Just not a lot of dinner prep time. Freezer Meals are where it’s at! It’s intimidating and I get it. Don’t be scared. Don’t get overwhelmed. You will yell at me as you’re putting them together (I yelled at myself), but think of the absolute bliss of having 40 meals seriously 40 dinners (and maybe 40 lunches) in the freezer. 40. yes I said 40. You will be so happy. You will not stress about dinner EVERY SINGLE NIGHT. Your life will be amazing. 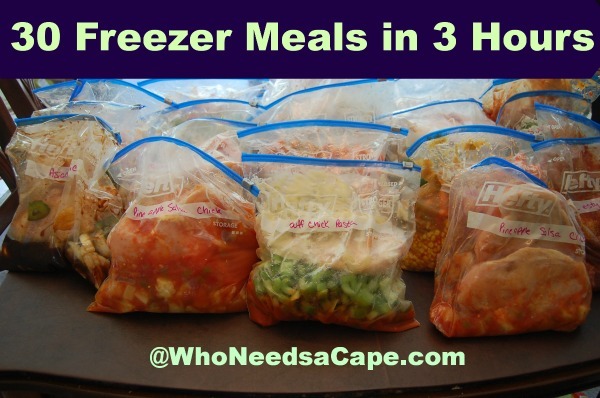 Unlike our other Freezer Meal Collections – I am not telling you that it will take 4 hours (or 3 or 2 or whatever). It took me about 5 hours to make this. Still worth it, but not the 4 hours I was hoping. I did have to brown meat this time, and I am SLOW SLOW SLOW. hahaha – I take my time when doing things or I get really cranky. My husband did help me on the last few meals because well he loves me! I recommend doing this when 1 – you’re alone so no distractions (I was not so lucky) or 2 – when you can beg your friend/mom/husband/wife to please hold open the freezer bag. I’ve done Freezer Meals now with help and with none and both work. Use pre-minced garlic. Yup fresh garlic is probably more tasty — but honestly you are freezing the garlic anyways. And garlic is in a lot of recipes so save some time! If the recipe calls for a can of this or that — just put that directly into the freezer bag — no need to mix until you’re cooking it. 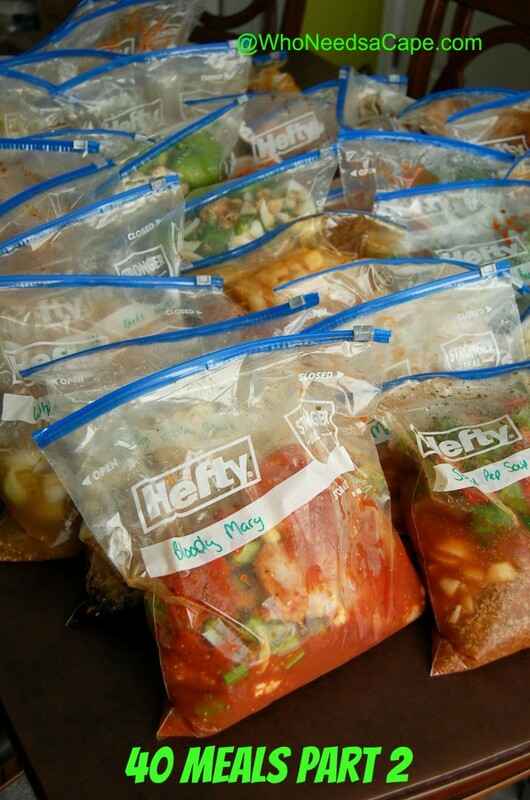 Pull the bag you want to use the night before and let it semi-thaw in the refrigerator overnight. It will be thawed enough to get into the slow cooker and it will be great. Going to be gone all day? Don’t want to buy an expensive slow cooker with a timer? Use a light timer that the slow cooker plugs into. It’s a great, cheaper alternative. Like I said – don’t stress. It’s food. I ran out of corn – yes I the lady who put all of this together thought I had more corn in my house than I did…so I ran out. DUH. I just wrote “NEEDS CORN” on the bag and threw it in the freezer. We survived. To help make it easier I put together a list of groceries you’re going to need. I will not put a price on it 1 – because I don’t know because of course I went to different stores (I’m weird) and of course I bought other things and 2 – because prices vary so much on region. Just know that you’re saving money if you 1 – shop sales to stock up on meat 2 – you’re not ordering pizza (AGAIN). Alright – here are the meals. Everything is doubled so there are 20 meals x 2 to make 40. I tried to make a good blend of different types of meats. I get bored if I have chicken EVERY SINGLE NIGHT (although my husband would be so happy). The moral of this whole post – is DO IT! You can do it! You should make these meals and you should make them today! Whether it’s the holidays, being a sports mom, working overtime, working 2 jobs, school, or just you want to – these meals will save you time. They will save you money. And they are delicious! I promise!!!! Give me your feedback in the comments! 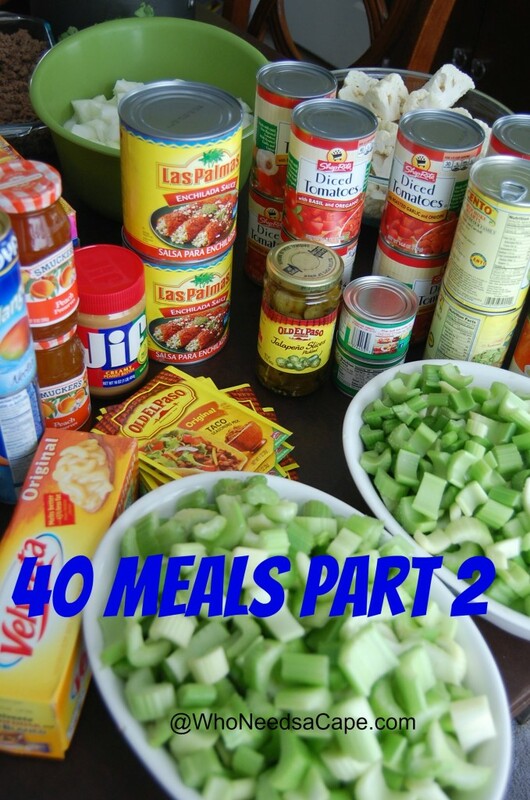 Before I go…If you’re not up for 40 meals (I get it I do) check out our other collections! 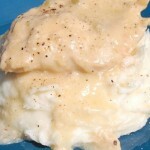 Follow Who Needs A Cape?’s board Freezer Meals, Slow Cooker & Crockpot Cooking on Pinterest. I love your idea of using a light timer for the crockpot! have one I bought at Walmart’s black Friday sale last year… for $7.99. It doesn’t have a timer. I will try this idea! This was a fabulous idea. Now I sort of regret asking for a crock pot with a timer for Christmas! Here is another good tip: crock pot liners!!!!! Make clean up a breeze! Especially if you need the pot again for the next day! TRUE! These things are a LIFESAVER! Even if it doesn’t keep all of the mess contained, it will still make clean-up a million times easier! Awesome! 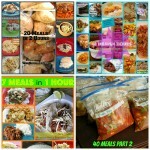 My two besties and I did the original 40 meals in 4 hours (though even with three of us it took longer than 4 hours!) before the birth of my daughter, and those meals lasted the hubby and I a LOOOOONG time! With #2 on the way, I’m happy to see some new recipes have appeared, and I just finished sorting through which ones I liked best last time and the ones from this list that sound like they’ll hit the spot to make my own 44 Meals (in however dang long it will take) recipe list and shopping list to fill the freezer before #2 arrives 😉 Thanks for all the great recipes! I love love love that you are making your own set. Congrats on Baby number 2 and let us know what you like and what you make!!!! I clicked 6 links and STILL could not get the recipes. What did I do wrong? Nothing at times our site has been overloaded! Hello , is there a list of all the meals you created since you started doing this with a master list ? How many servings does each bag contain? You say the serving size is about 4, but like on the cashew chicken it only calls for 3 breasts. Are we shredding the chicken when its done? I did 20 meals today – one version of each recipe. It took a long time but probably because I didn’t do all the chopping at once; I did use a jar of garlic though. I actually assembled each recipe individually, too. I also substituted all the ground beef for stew meat. If the recipe was soup, I just cut the stew meat up more. I used my trusty food saver instead of Ziploc bags; that may have added time too! I hope they are as delicious as they sound! oh I’m so so so so excited! ENJOY! 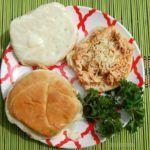 I haven’t done a lot of Crockpot cooking myself, but my daughter could really use some help (busy mom of 2 littles). I selected several of the freezer meals to put together for her to cook in her 6 qt. Crockpot, and have completed 4 so far, but I’m wondering if some of them are really large enough. They don’t look like they will fill even half of the Crockpot, and I have read that it should be at least half full to cook properly. (For example, the Lemon Garlic Chicken). Would appreciate any help! Thanks for putting these recipes together. Yeah – some of them don’t fill my slow cooker either – you can adjust your cooking time (it takes less time if the slow cooker isn’t full) or you could add some broth 🙂 I cook exclusively dinners in my 6 qt – only thing is sometimes they are done faster! Good luck! I always buy frozen chopped onions when I make my freezer meals. It makes the process so much faster and less tears. Someone else told me that too – I forgot when putting this together but it’s a great tip – thanks! Hello, I think I found a mistake in the list. Seems like its missing the 4 C of dry pasta needed to make the Taco Soup. Just thought I’d let you know! To fill freezer bags without help, fold the open edge down to the outside (keeps the zipper cleaner too) and place in a narrow/tall bowl or large measuring cup to hold it upright. If it will fit, use a large mason jar. And you can clip one side to the bowl if necessary. I retired so I make the meals. Love to cook. Looking for crock pot ideas to cook. But most of these are Jalepeno, buffalo,taco, hotly.All spices and hot! Any other ideas for kids to eat? Hey use onion flakes (spices) instead of onions. Works great no chopping, fast easy and great if someone doesn’t like onions they won’t know they are there and you get the great flavor. Love the precooking idea! 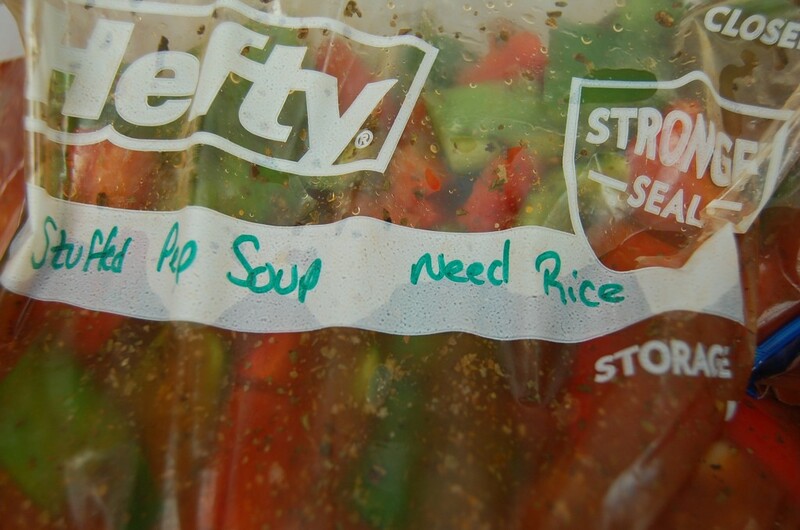 BUT…..I look at recipes and 15 of 20 recipes here are spicy or hot. Of the 5 people living in my house, not one would eat over half of the recipes. (though they sound incredibly delicious!) I know this is the trend now, well this or meals with Quinoa or Kale everywhere. Are there recipe sites for more um, gentle food? We the chronic users of Prilosec and the under 4 crowd We Thank You for the Kitchen Goddess you are. 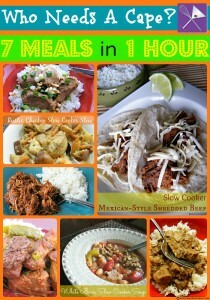 Check out our 66 slow cooker meals post – I’m sure you’ll find a bunch in there 😉 also 20 meals has some milder dishes! I’m new to freezing stuff. What are some do’s and don’ts to freezing? A big fan of all of your collections. Just did 40 part 2 today with my meal buddy and there were several items left off the shopping list. Yes I should have gone over the recipes but I had never experienced an issue with the other collection so I just went with the list and no recipes. Peach jelly being one of the items, I started writing them down but when I hit around 6 or 7 I thought maybe I left off a page. I hope an updated version is released soon thanks so much for saving my family’s dinner sanity! Peach Jelly is part of the Sriracha Peach Recipe 🙂 I maybe could help with the other recipes? I LOVE this idea and I really want to try it. We currently live in an apartment so no deep freezer or extra freezer in the garage, etc. Is it possible to do all these recipes and store them in a basic, standard sized freezer? No I really don’t think so unless you have NOTHING in your freezer and do space saving things like adding broth the day it’s cooked instead of in the bag. 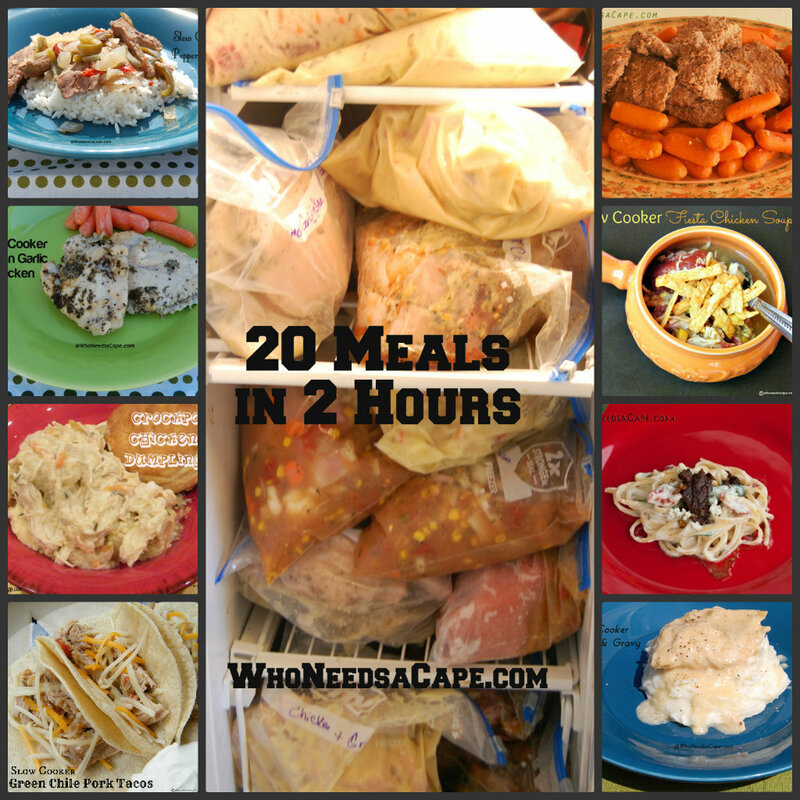 I would really check out our 7 freezer meals and our 20 freezer meals. 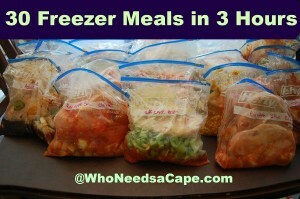 See how much you can get in your freezer with those and then go from there. 😉 Good luck! Hi, Looking at the chicken enchilada soup, how do you prep it for freezer ? It doesn’t say how to and im not sure what to leave out of the bag..
Hi Nina, Those instructions were missing, they are added now. If freezing prior to slow cooking, omit tortilla chips from freezer bag. Place in refrigerator night before to thaw, dump into slow cooker and follow directions as noted above. Hope you enjoy! Hi Amy, I’ve been onto the post in the past few minutes via desktop, laptop, tablet and mobile with no invasive ads blocking my way to any of the attached recipes. Perhaps try clearing your cache or history as this is most likely not an ad from our site. I do hope this helps. Hi there! Is there a link to a page where I can print all the recipes out at once instead of searching through each of the links? Thanks! Is there a master shopping list like the previous one you made? I found it, never mind! I just wanted to drop you a note to tell you how helpful your website has been to me. I used to like spending an hour or more in the kitchen making dinner, but no longer. Now I’m all about fast and easy, and as long as I can get 90% of the flavor I used to get from sweating over hot pans for hours, I’m a happy camper, and so is my husband. 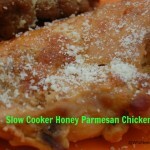 I’ve learned to love my slow cooker, and just began making freezer meals. But I still don’t want to spend hours in the kitchen to make them! Those all-day shopping and prep sessions seems really daunting at first. But I loved Heather’s advice (in the Honey Bourbon Beef entry) to just make 1 or 2. So now when I’m making a recipe for the 2 of us, I prep the full recipe as written, divide it into portions for 2, then cook 1 and freeze the rest. In this way, I’m slowly stocking my freezer, and spending only about 5 extra minutes in the kitchen. We still get the variety we love, with no repeats until the next month. Because I use a recipe/meal planner app, I’ve got the recipe right there, with no need to make notes on the bag beyond the name of the recipe and the date I prepped it. I can just look at the calendar on my app and see what we’re having the next night, then move that bag to the fridge. I include your tips about adding more broth to soups or which tender veggies I want to add at the end of cooking right in the app’s notes and I’m all set to cook. And by cook I mean throw the contents of the bag in my slow cooker or Instant Pot. All this is to say that cooks shouldn’t let the one-time prepping marathon scare them. Prepping multiples of 1 recipe is the easiest thing in the world, and the payoff is huge. Thanks for all your help, ladies, your simple tips have made my life much better!